Happy Friday Wyrdos! It's time for us to continue taking a peek at the Other Side. 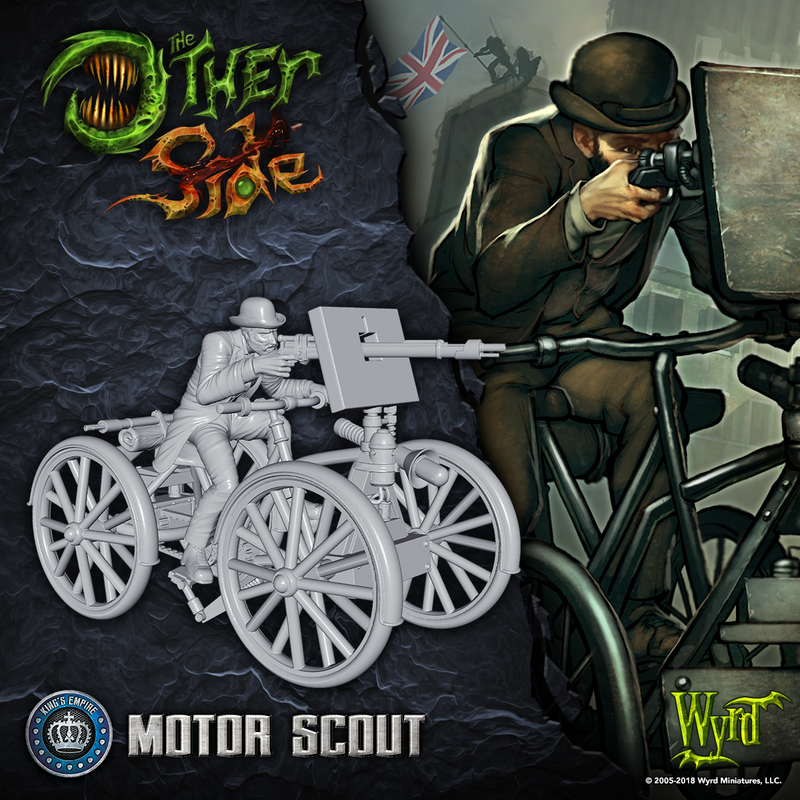 This week we are going to be traveling the streets of London in style with the Motor Scout! Let's take a look. The Military Service Act brought in more than just traditional soldiers. It also resulted in the recruitment of a large number of inventors who were more than happy to bend their minds to the task of supporting the Empire. One of the more successful of them was Alphonse Whittenchapel, the inventor of the Motor Scout. By combining a quadracycle with a machine gun, Alphonse seemed to be the epitome of an eccentric inventor. Meanwhile, the cheap and fast Motor Scouts have gone on to be used by untrained troops to harass enemy lines. On the tabletop, Motor Scouts have a decent ranged attack that gives out Pinned Tokens. When combined with their high Speed, this makes them a good (and cheap) harassing unit. Their ability to multiply on the tabletop cannot be overlooked, as multiple Motor Scouts can quickly overwhelm an opponent with Activations and Pinned tokens. I'd be wary of these guys' ride bys. I just read the card on the scout, and for the points it is a pretty decent harrier. It has a fair range, is potentially very mobile and can even spawn other scouts when flipped to glory. It will likely crumble to any unit that engages it, but if it can maintain its range, it could be a problem on the flanks. And cards in the spokes!